A Canadian woman enjoying a vacation in Bermuda last month found herself in need of aid while swimming at a private beach, paving the way for a stranger with close Canadian ties of his own to come to her rescue. 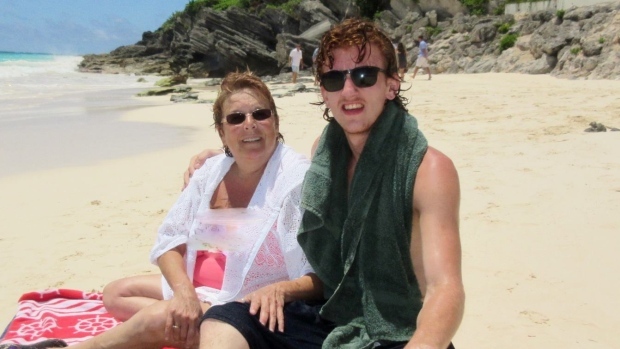 A CBC story says, “Marge Rabouin, from St. Andrews West southeast of Ottawa, travelled to Bermuda in late July with her grandson. They visited a private beach to go snorkelling. “My grandson never listens, so he got farther and farther. And we got caught in a bit of an undertow, and by the time I came back up, I noticed my grandson was too far,” she told CBC News on Monday. “Rabouin said she pushed her grandson to safety and re-fractured ribs she’d hurt months ago. “I wasn’t able to swim back, because when I re-fractured my ribs, I lost the ability to swim strongly,” she said. “Weak and caught in a rip current, Rabouin said she started to yell for help — but nobody came. Twice the undertow dragged Rabouin into deeper water. On the third pull, she thought she was going to die, she said. “Rabouin said she was in shock. She remembers someone else helping the man as he lifted her to shore. But as quickly as the stranger entered her life, he left it. “That man turned out to be AJ Darby, 18, who had moved to Bermuda only one week before the incident. The two briefly found each other later that day, posed for a photo, and discovered something else in common — a strong connection to Nova Scotia; Darby had just moved from Truro, and Rabouin lived in Nova Scotia for more than 20 years. “I think everyone will tell you that you look at things a little differently. I’m just happy to wake up every day,” she said. Great story. Those South Shore beaches really worry me. Especially Warwick Long Bay as there is a drop in the sand as you wade in the water and constantly takes tourist and locals by surprise. I don’t recall seeing a lifeguard on duty at Warwick Long Bay. I think there should be one on duty as that beach seems to be more dangerous than Horseshoe Bay where there is lifeguards on duty. Just a thought to have one put there. Wow, what a young man! I hope he gets a medal. Ms Rabouin deserves one too for helping her grandson to safety first. Sml is correct Warwick long bay will pull you out quick…goes quick deep too.Strong tide…always best to swim when other people are present.